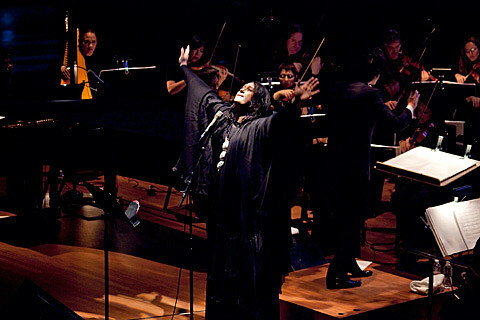 The Museum of Modern Art has commissioned artist/musician Antony to conceive, produce, and perform a large-scale concert and performance event, Swanlights, with Antony and the Johnsons, on Thursday, January 26, 2012, at 8:00 p.m. at Radio City Music Hall. Featuring a 60-piece orchestra, the performance piece is conceived as a new commission especially developed for the January 26 performance, and an evolution of the highly acclaimed The Crying Light, which was presented at the Manchester Opera House for the 2009 Manchester International Festival. Envisioned as a meditation on light, nature, and femininity, Swanlights includes songs from all four of Antony and the Johnsons’ albums (self-titled, I am a Bird Now, The Crying Light, and Swanlights), set to symphonic arrangements by Nico Muhly, Rob Moose, and Maxim Moston. It is produced in collaboration with light artist Chris Levine, lighting designer Paul Normandale, and set designer Carl Robertshaw. Antony and the Johnsons: Swanlights is organized by Klaus Biesenbach, Chief Curator at Large of The Museum of Modern Art and Director of MoMA PS1, with the assistance of Eliza Ryan, Curatorial Assistant, MoMA PS1. This month also sees a work-in-progress screening of TURNING, a film by Charles Atlas and Antony on November 11th at Copenhagen’s Documentary Film Festival CPH:DOX. Tickets go on sale Saturday, 11/12 at at 10am.